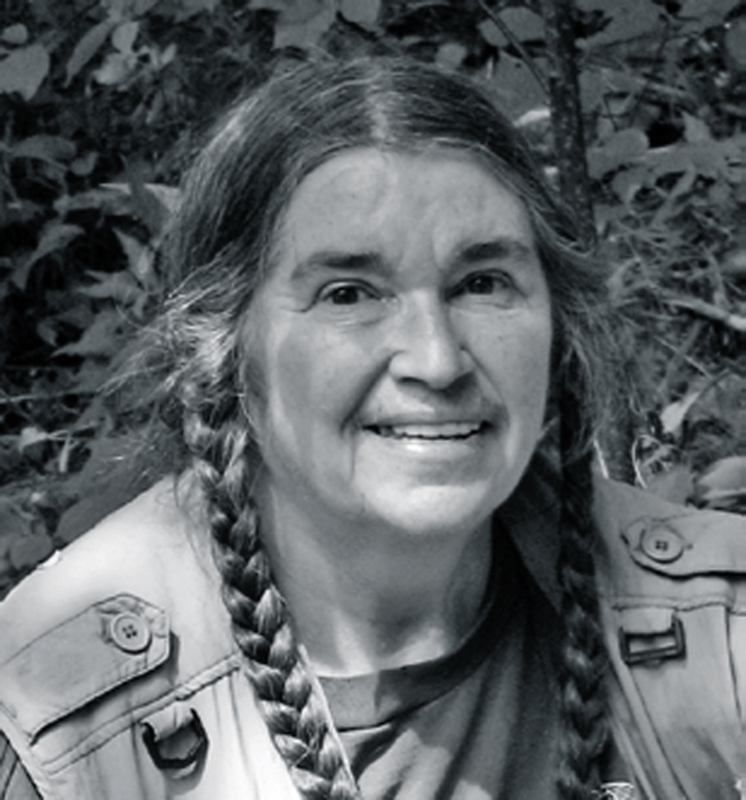 Bernadette Mayer has been a key figure on the New York poetry scene for decades. She is the author of more than two dozen volumes of poetry. Her most recent book, The Helens of Troy, NY, was published by New Directions this past spring. She lives in upstate New York. A poet gives us his descriptions of some hypnagogic visions. The constraint is that what he sees is the world. This world becomes different colors and can be full of dragonflies, roses, ice cream, spiderwebs, butterflies, and pyramids. Write descriptions of what you see, eyes closed, in the sun, compared to eyes closed before sleep. Concentrate on the area with the most turmoil. Try to recognize different incipient emotions in this panorama. For this you have to be a little more awake. See what emotions are associated with which colors. Designated as a UNESCO World Heritage Site in 1994, this extraordinary set of earth carvings includes giant line drawings of geometric forms and a spider, hummingbird, monkey, and pelican. They can be viewed from the air or from an observation tower. What were these people thinking? Were they communicating with extraterrestrials? The animal images are the oldestBC old. Be prepared to haggle when visiting. 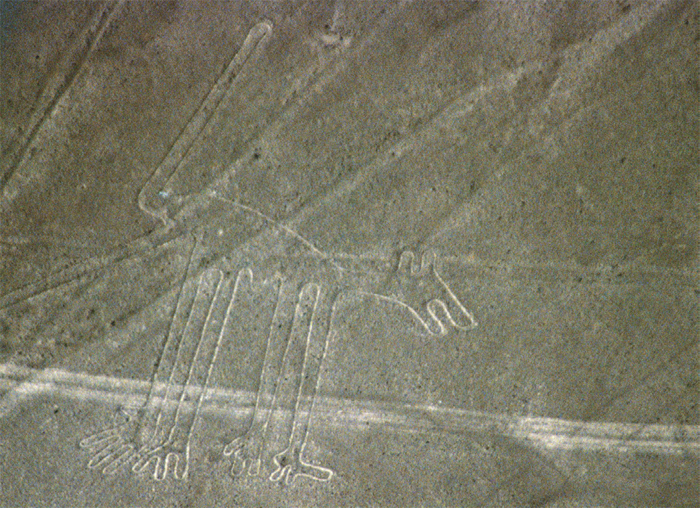 Nazca line figure (dog), 500 BC–AD 500, Ica Region, Peru, 2006. Photo: Colegota/ Wikicommons. No haggling here, you just take what nobody wants. Many of the leftover potatoes are heart-shaped. Oysters, apples, and figs are gleaned, some even by Varda. As we all know now, you can live out of dumpsters. Gleaning is a fine tradition. The French laws about gleaning are delineated in the movie. Varda is nothing if not charming and inspiring. Poet Andrei Codrescu goes on a road trip in a 1968 red Cadillac convertible. He visits communal places, new-age cure places, shrines, Detroit, a sausage factory, St. Mark’s Church in New York City, New Mexico’s Chimayó, and California. Poet Allen Ginsberg appears walking the sidewalks of the East Village espousing his wisdom. As an immigrant, Codrescu discovers America. We watch him be reborn! Four stills from Roger Weisberg’s Road Scholar, 1993, 35 mm, color, sound, 82 minutes. Andrei Codrescu and Crissa “Bo” Bozlee. 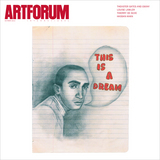 Written in connection with a one-man show of his “snare pictures” at the Galerie Lawrence in Paris in 1962, Spoerri’s book-length inventory of tabletop contents, published in English by Something Else Press, was translated from the French and further anecdoted by Emmett Williams. The book is illustrated by Roland Topor. Spoerri’s Fluxus artist friend Robert Filliou also helped with the project. The anecdotes on what was left on the table after lunch sometimes go on ad infinitum, down to crumbs and grains of salt. It’s the ultimate catalogue raisonné. A surrealist painter of Spain, France, and Mexico, Varo painted allegories about physics. I got to see her paintings at Chicago’s Mexican Fine Arts Center Museum in 2000. Since it’s necessary to experience the magic of her work in person, you will have to go to Mexico to see it, perhaps on your way to Peru. Reprinted by Amok Press in 1988 with an introduction by Kathy Acker, this is the story of a Berthalater revealed to be an amalgam of three female Depression-era hobostraveling on freight cars in the 1930s, as told to Ben Reitman, a physician, radical, and lover of Emma Goldman. An explanation by Luria, a Russian psychologist, of the synesthetic mind of a man who became a mnemonist but couldn’t live his life. If a menu was badly written, he couldn’t eat. The most fascinating part describes the associations the mnemonist used to remember the first stanza of the Divine Comedy in Italian, a language he doesn’t know. A history of the methods used to call things to mind, including Giordano Bruno’s astrological memory systems; the techniques used by Greek orators; the memory theater of Robert Fludd; and Lullism and Ramism. If you paint on your ceiling everything in the world, you will remember it all in the morning, as you will see from this book. This indoor bridge connects the second floor of Sol LeWitt’s retrospective at MASS MoCA (on view through 2033) to the museum’s performing arts building. On a recent visit, the pathway featured an audio installation by Glenn Kotche. While you walk the covered pathway, you hear bursts of music and sounds, much like a hallucinatory experience. The destination is the walk; you may even fall for the metaphor of a bridge (which has railings). Bruner/Cott, John Cage/Merce Cunningham Bridge, 1999, MASS MoCA, North Adams, MA. Photo: Michael Roach/Flickr.